At the beginning of 2019, it was reported that over 26 million individuals had taken an at-home DNA test, but the companies seeking to profit off of the most unique thing about us still remain largely a mystery. So who are the two superpowers harvesting the largest trove of human DNA? What do they do with your DNA after they send you the test results? And most importantly, why should you care? This is a documentary meant for educational purposes. A few weeks ago we went deep in G5 and what’s in store for us in terms of what the governments planning, and this week we dive back into that world. Suzanne Maher is the founder of www.byebyebluesky.com and an expert in chemtrails and nanotechnology. To quote her website, “Bye Bye Blue Sky is a dedicated global public environmental movement who seeks to be a voice for all living creatures and ecosystems, to protect human health and safeguard the natural environment, air, water and land, which our sustenance depends. So let’s get ready to discuss whether chemtrails are real or not (spoiler – they are) as well as nanotechnology. This documentary includes both news and civilian reports about the terrifying environmental warfare that is currently taking place worldwide which relatively few are aware of. This war is waged by the powers that be against the every living creature on earth. Ken Rohla joins us to talk about scalar frequencies, ormus and free energy devices. We also discussed the rest shield and how EMF pollution contributes to the breakdown of cells and DNA. We also talked about meditation and how raw foods can help detox and cleanse your body. Last but not least we also discussed how to grow foods with scalar energy, rock dust, ormus and ocean water for more minerals! Thanks for watching, sharing and telling your friends! 20 years of research into Chemtrails have lead to unusual consequences; Morgellons, Mind Control, and Black Goo rise to the surface. Harald Kautz-Vella talks about electromagnetic and biological weapons, nano technology, DNA restructuring, Morgellons disease and a substance called Sentient Oil or “Black Goo” which mirrors the consciousness of humans and that of alien entities such as the Archons. He is a physicist, geologist and author living in Germany. Cara St. Louis is an American activist and author who has been traveling the world speaking about The Aerosol War since 2010. She shares a snapshot of the 20th Century as an all-out social engineering war against humanity with the goal of cultural revolution. Cara asks, can we remember who we are and take back the power; Our Imagination. Kandy Griffin Vandawalker delivers an eye opening deep dive into the world of Nano technology and how it is being used to interface with the human organism to manipulate, control and attempt to transform our natural/organic nature. Ken Rohla is a natural health educator and inventor specializing in rejuvenation and cellular regeneration. Formally educated in electrical engineering and computer science, Ken worked for 23 years in the medical industry, then became certified as a natural health educator in 2005. In this discussion, we begin with a broad look at the vaccine industry and the detrimental implications of mandatory vaccinations. Ken explains some simple remedies that can be used to prevent or heal damage from vaccines. He gives an overview of scalar waves and how this energy can be altered at a subatomic level in the body to promote healing and wellness. We talk about the effects of radiation fallout from Fukushima and other nuclear radiation disasters, and Ken emphasizes some of the nontoxic technologies available to neutralize and clean up the mess in our bodies and environments. In the second hour, Ken names and defines key supplements and nutrients for detoxifying and healing the body from damaging exposure to everyday pollutants. We discuss the issues of GMO foods and organic food options that are extremely lacking in nutrients. Ken makes note of the solutions available for individuals to get nutrient dense, inexpensive superfoods by growing indoors using hydroponic and aquaponics tower gardens with high Ormus nutrients. Further, we discuss the different psychic forces on the planet battling for control of our minds and how we can unplug from the programming. Lastly, we look at the best methods for filtering and cleaning up water. Over the past ten years, more than 100 000 people in the United States and in Europe have complained about a strange and devastating skin disease known as Morgellons. The medical community is divided between those who dismiss it as a psychological disorder and those who regard Morgellons as an emerging disease deserving further study. This issue would normally be confined to scientific medical journals if the Pentagon and federal “law-enforcement” agencies were not so actively engaged in hiding it from the public. In the first part of his investigation, Hank Albarelli reports on a controversy which leads straight to new weapons experiments of the most secret order. Three weeks ago, we wrote about a “disease” known as Morgellons that very few people in the world know anything about. We placed the word disease above in quotation marks only because a large number of physicians refuse to recognize Morgellons as a medical affliction, with some even refusing to treat patients who suffer from it. We have listened to a long litany of accounts about doctors who have literally laughed in the faces of Morgellons sufferers, male and female, young and old, with many attempting to make referrals to psychologists. Remarkably, other physicians have mounted web sites mocking and attacking people who report they have Morgellons and those who write about it. Some physicians have dubbed the disease Delusions of Parasitosis, meaning it’s all in the patient’s head. Additionally, there is a website entitled morgellonswatch.com “dedicated to examining the claims made regarding what is termed ‘Morgellons Disease’” and to preventing “sick people into thinking they may have a terrible disease.” Oddly, there are no formal individual or institutional sponsoring names identified on this site. Over two years past the CDC’s announcement it appears unknown as to when the study will be completed or be released. About a month ago there were unconfirmed reports that the study had been handed off entirely to the Armed Forces Institute of Pathology in Washington, D.C., an identified partner in the study as explained by the CDC in 2008. The initial symptoms of Morgellons involve patients experiencing the discomforting sensation of insects crawling on and biting or stinging their skin. This sensation results in skin lesions that can appear much like mild to severe cases of acne. 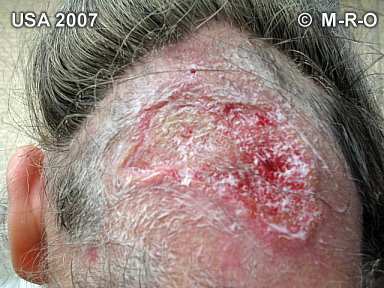 The lesions can appear anywhere on a patient’s body and quite often contain fiber -like strands or fibrous material. 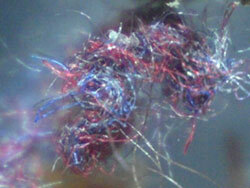 The fibers are the most perplexing visible feature of Morgellons. Often when an attempt is made to remove or extract the fibers the material will resist and act to withdraw or move away from whatever instrument is being employed. Skeptics have put forth various explanations for the presence of the fibers that plague sufferers of Morgellons disease. Some have suggested that the fibers are merely clothing fibers, and other common everyday material, that become attached to scabbed lesions accidentally; the sufferers, skeptics claim, are falsely convinced that the fibers are being produced by their bodies. Other explanations are less kind; many ascribe to the idea that the lesions themselves are a product of “neurotic excoriation,” a psychological condition wherein the patient scratches the skin compulsively to the point of creating wounds, or even that they are created deliberately by the sufferer in an effort to convince others that he is suffering from a disease. The fibers, these skeptics explain, are then collected by the sufferer from non-bodily sources, as a means of providing “evidence” that the disease condition exists. The psychiatric community has long associated the collection of body specimens with delusional parasitosis and other psychiatric or fictitious conditions. In fact, the act of collecting these specimens is, itself, considered a psychiatric symptom, referred to as “the matchbox sign.” The name is a reference to the fact that fibers and other material are often presented in small containers such as matchboxes. As a result, the collected specimens are often disregarded completely by healthcare providers, and a psychiatric cause is assumed rather than a physical condition considered. These arguments fall apart quickly, however, when the fibers — and the patients — are actually examined. Morgellons fibers, when examined closely, consistently appear as autoflourescent, meaning that they exhibit a glow under ultraviolet light. Certain marine organisms, such as particular types of jellyfish, also have autofluorescent properties. One fluorescent protein, known as “green flourescent protein,” has been studied extensively in recent years as a marker in the study of gene expression; it has been successfully introduced into many bacteria and fungi, as well as into fish, plant, insect, and even human cells. Fluorescent markers, in the form of genetic modifications or dyes, are also often used to track the presence of microbes in the environment. Oil consuming microbes, for example, are often marked with the use of a fluorescent stain for monitoring purposes. A privately funded study conducted by Dr. Hildegarde Staninger, Industrial Toxicologist & Doctor of Integrative Medicine, revealed that the fibers are able to withstand temperatures of up to 1700 degrees Fahrenheit [= 927º C] before burning, and that they do not melt. Her results indicated that the fiber’s outer casing appears to consist of high-density polyethylene fiber, an industrial material commonly used in the production of fiber optic cables. Interestingly, this material is also used in the emerging field of bionanotechnology as a compound to encapsulate a viral protein envelope. Furthermore, Staninger reported finding blue fibers that exhibited a golden tip; she believes these to be a form of nano-machinery, able to be programmed to perform specific functions. Is there a globalist agenda behind the legalisation of pot? “Through a network of nonprofit groups, Mr. Soros has spent at least $80 million on the legalization effort since 1994, when he diverted a portion of his foundation’s funds to organizations exploring alternative drug policies, according to tax filings”. In 2013, the Marijuana Policy Project listed its “Top 50 Most Influential Marijuana Users”, which they claim is “meant to identify people who have used marijuana and achieved high levels of success or influence”. George Soros is ranked 9th, alongside Barack Obama, Bill Clinton, Oprah Winfrey, Stephen Colbert and Bill Maher (one can only guess which other ‘users’ lists this crowd also falls under). Not to mention, it’s always comforting to know that your President might be stoned at the wheel of the nation (by contrast, the golf doesn’t seem so bad). In the US, the much-celebrated Colorado story has dominated pot news, and there are a number of other states set to follow. Aside from the Soros agenda for a One World Government, financing the Occupy Movement and of overthrowing governments, destablising nations and fomenting civil wars around the globe through carefully planned ‘color revolutions’, how does the Open Society Institute’s push for legalisation of drugs fit into all of this? They say the Uruguayan government hopes legalising the sale of marijuana “will tackle drug cartels”, but what they’re not telling you is that they are paving the way for a bigger drug cartel to take over. 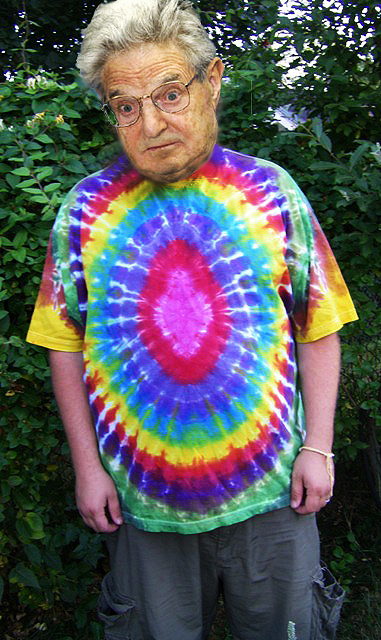 Soros is reportedly also a big Monsanto shareholder, and guess who is test planting their GMO version of cannabis later this year in Uruguay? Yes, it’s Monsanto. BTW – Monsanto’s best lobbyist right now is Barack Obama himself (it’s not about cool, or pot – it’s about eugenics). Late last year Uruguay became the first country in modern times to legalize cannabis. I feel the same way about cannabis prohibition as I did about the Berlin War the first time I saw it (when it was still up). It makes no sense at all. Cannabis is a plant. How can a plant be illegal? It’s a nutritious food (the seeds), a sturdy fiber (the stalk), and a multi-facted medicine (the leaves and flowers). One country has gotten the clue: Uruguay. The general law has been passed. Let’s see how they execute on the details.